After media exposé, Migori Governor Okoth Obado has been moved from a “VIP section” to a block where suspects charged with capital offences are held at Nairobi’s Industrial Area Remand Prison. Among media houses which aired the story were People Daily and Citizen TV with our premium site Migori News posting it too. 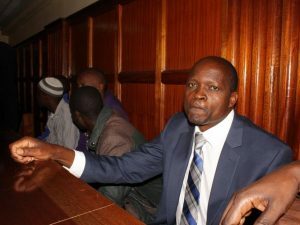 Last Thursday, Justice Lesiit sent Obado back to remand for 11 more days, coming as a major blow since he had already been behind bars for a week. The governor is now reportedly blending with other suspects donning a grey uniform. Earlier it was said he was wearing civilian cloathes. Dinner is served at 4 pm.